. Tōno monogatari 遠野物語 Tono Monogatari. Yanagita Kunio had his reasons for being interested in the afterlife. He had lost his young girlfriend (a one-sided love affair on his side though) when she was just 19, dying of tuberculosis. He kept asking himself where she would be now. Still in his room? Or near her grave? or far away in paradise? While she was ill at the home of her parents, he had written a story about a little bird (himself), which she could keep in her room beside her bed, and he would sing for her all day long to make her feel better. 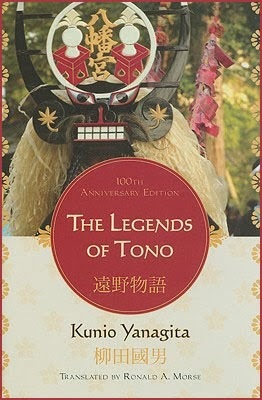 His interest in the legends of Tono stemmed from this interest of the soul in the afterlife.
. Yanagita Kunio 柳田國男 . deals with this subject too - and is quite up to our times about the Great Tsunami ! 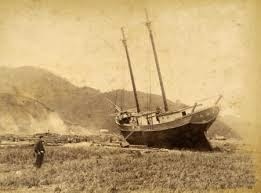 The story deals with the aftermath of the Great Tsunami of the Sanriku Coast about 120 years ago, on June 15, 1896. A man called Fukuji 福二, who had moved from Tono and lived happily with his wife and three children in the coastal town of Tanohama lost almost everything in the tsunami, only he and two children survived. He just could not understand his fate and was deeply disturbed and unhappy all the time. He had to live with his two children in a shelter near the site of his original house. One day a year later, when he walked along the beach in the fog, he saw a pair in white robes, like the dead, coming nearer. It was his dead wife with a young man (she had known befor marriage and who had also perished in the tsunami). As they walked past him his wife said with a happy smile "Now I am the wife of this man." When he asked her: "But don't you worry about our children?" she began to cry, but the pair faded away in a hurry. He tried to follow them and run after them, but to no avail. When he came home later he became ill with grief and suffered and had to rest for a long time before recovering. And now comes the jump to our times, and the great tsunami in 2011. A descendant of Fukuji in the fourth generation was still living in the same area. 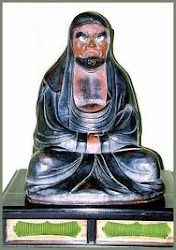 Fukuji was the ancestor of present-day Sasaki san 佐々木喜善の祖母の弟. Sakaki had learned about his ancestor Fukuji in the year 1930. His family had to overcome the sorrows after the Tsunami in 2011, and have to live on beyond their pain, looking to the future. Fukuji had married again and become a fisherman in Otsuchi. His his great-grandchild lived in Tanohama as fishermen too. The home of Fukuji's ascendant was hit by the Great Tsunami of 2011 and he lost his beloved mother, who was the only one in his family who had told him the sad story of Fukuji. When the quake happened, he and his daughter had just found the time to climb to a higher place behind the home before the tsunami hit. His wife had been absent in another village and also survived the tsunami. He just could not get over this great loss and all the destruction on the beach. His mother was in the kitchen preparing his breakfast. "I am all right, I will care for you and be close to you" she told him - and at that point he woke up. Suddenly he felt relieved and remembered more than ever the story of his great-grandfather and the loss he had suffered. Since the tsunami he has to live in a temporary housing complex with his family. Now he goes to the grave of his mother with his daughter, and tries to tell her the story of the ancestors to keep the memories alive. Live comes in many shades and humans have to deal with them the best as they can. The 1896 Sanriku earthquake was one of the most destructive seismic events in Japanese history. The 8.5 magnitude earthquake occurred at 19:32 (local time) on June 15, 1896, approximately 166 kilometres (103 mi) off the coast of Iwate Prefecture, Honshu. It resulted in two tsunamis which destroyed about 9,000 homes and caused at least 22,000 deaths. The waves reached a record height of 38.2 metres (125 ft); more than a meter lower than those created after the 2011 Tōhoku earthquake which triggered the 2011 Japanese nuclear accidents. On the evening of June 15, 1896, communities along the Sanriku coast in northern Japan were celebrating a Shinto holiday and the return of soldiers from the First Sino-Japanese War. After a small earthquake, there was little concern because it was so weak and many small tremors had also been felt in the previous few months. However 35 minutes later the first tsunami wave struck the coast, followed by a second a few minutes later. Damage was particularly severe because the tsunamis coincided with high tides. Most deaths occurred in Iwate and Miyagi although casualties were also recorded from Aomori and Hokkaido. I met a priest in the north of Japan who exorcised the spirits of people who had drowned in the tsunami. The ghosts did not appear in large numbers until later in the year, but Reverend Kaneda’s first case of possession came to him after less than a fortnight. He was chief priest at a Zen temple in the inland town of Kurihara. The earthquake on 11 March 2011 was the most violent that he, or anyone he knew, had ever experienced. The great wooden beams of the temple’s halls had flexed and groaned with the strain. Power, water and telephone lines were fractured for days; deprived of electricity, people in Kurihara, thirty miles from the coast, had a dimmer idea of what was going on there than television viewers on the other side of the world. But it became clear enough, when first a handful of families, and then a mass of them, began arriving at Kaneda’s temple with corpses to bury. Amid this numbness and horror, Kaneda received a visit from a man he knew, a local builder whom I will call Takeshi Ono. Ono was ashamed of what had happened, and didn’t want his real name to be published. ‘He’s such an innocent person,’ Kaneda said to me. ‘He takes everything at face value. You’re from England, aren’t you? He’s like your Mr Bean.’ I wouldn’t have gone so far, because there was nothing ridiculous about Ono. He was a strong, stocky man in his late thirties, the kind of man most comfortable in blue overalls. But he had a dreamy ingenuousness that made the story he told all the more believable. But once television was restored it was impossible to be unaware of what had happened. Die Stadt Tono in der Präfektur Iwate im Nordosten Japans ist vor allem als Heimat zahlreicher Volksmärchen, alter Sagen und geheimnisvoller Geschichten über Geister, Dämonen und andere Fabelwesen bekannt. 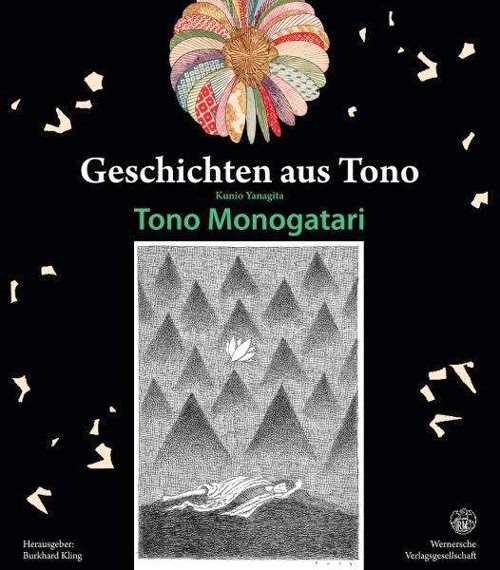 119 dieser über viele Generationen hinweg mündlich überlieferten Geschichten wurden vor fast 100 Jahren gesammelt und in dem Buch Tono Monogatari („Die Sagen von Tono“) veröffentlicht. Dieses Werk bildete zugleich den Ausgangspunkt für die Volkskunde in Japan. Eine knapp vierstündige Zugfahrt mit dem Shinkansen von Tokyo entfernt (mit einem Umstieg im Bahnhof Shin-Hanamaki), bieten die Stadt Tono und ihre Umgebung dem Besucher noch heute eine große Vielfalt an landschaftlicher Schönheit: von nebelverhangenen Bergen bis hin zu schmalen Pfaden, die sich zwischen Reisfeldern winden. Wer in diese Landschaft eintritt, hat sofort das Gefühl, als sei er in die Welt der Volksmärchen eingetaucht. liegt in einem von Bergketten eingerahmten Becken etwa 40 km westlich der Pazifikküste. Diese Region wurde vom schweren Erdbeben und dem Tsunami im März 2011 besonders hart getroffen. Seit dem Erscheinen der „Sagen von Tono“, einer Sammlung von kurzen Geschichten über Ereignisse, Überlieferungen und Bräuche in der Region Tono im Jahr 1910 ist diese Stadt in ganz Japan als Heimat der japanischen Volkskunde bekannt. Die Stadt selbst blieb von den Umwälzungen, die während der Ära des raschen Wirtschaftswachstums in Japan das ganze Land erfassten, größtenteils verschont. Dadurch bietet Tono dem heutigen Besucher noch eine ganze Reihe von Ansichten, die an alte Zeiten erinnern. Der Volkskundler und Herausgeber der Sagen von Tono, Kunio Yanagita (1875-1962), gilt allgemein als Begründer der Volkskunde in Japan. Im Vorwort zu dem Werk heißt es: „Im Umkreis von 40 km um die Stadt Hanamaki gibt es nur drei Städte. Die übrige Region besteht aus grünen Bergen und offenen Feldern.“ Diese Landschaft, die in einer knapp einstündigen Zugfahrt vom Bahnhof Shin-Hanamaki aus erreichbar ist, sieht vom Fenster der langsam fahrenden Züge aus betrachtet selbst wie der Prolog zu einer Erzählung aus – ein Prolog aus Bergen und Wäldern, die gemächlich am Betrachter vorbeigleiten. Tono erlebte einst eine Blütezeit als Burgstadt und Rastplatz für Reisende, die zwischen dem Innern des Landes und der Küste reisten. Heute birgt die Stadt viele Orte, die es dem Besucher noch immer ermöglichen, sich ohne Weiteres vorzustellen, wie sich das Leben hier vor hunderten von Jahren gestaltete. Elf Kilometer westlich vom Bahnhof Tono entfernt befindet sich das Anwesen der Familie Chiba, das als wichtiges Kulturgut des Landes registriert ist. Das Haus ist ein Bauernhaus im sogenannten nambu magariya-Stil. Seine besondere Bauweise, die aus der Vogelperspektive wie ein L aussieht, und bei der das Wohngebäude an den Pferdestall stößt, war bis vor fünfzig Jahren in dieser Region allgemein verbreitet. Das Anwesen ist rund 200 Jahre alt und erinnert ein wenig an ein Schloss. Die Grundfläche beträgt 550 m2 und beherbergte früher bis zu 25 Personen und zwanzig Pferde. Menschen und Tiere lebten somit unter einem Dach. Die kalten und schneereichen Wintermonate trugen dazu bei, dass die Menschen in dieser Region ihre Pferde quasi als Familienmitglieder betrachteten. from Mount Hayachine 早池峰山 - as told in the Tono Monogatari.